60.00 CT ,TOTAL WEIGHT (GEM(S) SETTING) 12.00 gr. SIZE - LENGTH Adjustable. PRODUCT TYPE Ring. BIG! 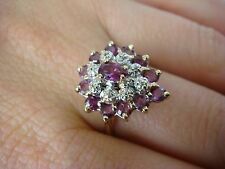 10.50 ct NATURAL RUBY RING,FINE ESTATE JEWELRY 925 S.SILVER.SIZE 8.25. Shape:Natural Ruby with beautiful natural inclusions 15.0 mm x 13.00 mm. = 10.50 ct. Exact Carat Total Weight: ( Silver Stone) 23.20 ct, 4.64 gram. Color: Blood Pink red. Ring Size; 8.5. BIG! BRILLIANT NATURAL WHITE TOPAZ 5.50ct,RUBY RING 925 Sterling SILVER.S-e7.25. Ruby 1.0 mm x 6 pcs. Big Bold and Beautiful! Very Elegant Natural White Topaz Lady’s Ring, Beautiful High Sparkle and beautiful Jewels ! - it is so Gorgeous ! Pictures do this ring no justice ! Fascinating, Big Bold and Beautiful! Very Elegant Pink Red Ruby Lady's Ring – Pear facet cut Styling Ruby Beautiful center stone - VVS -Transparent Heated Beauty - Very beautiful Stunning Cut Pink Red Ruby 14.5 mm x 10.5 mm = 6.80 ct center stone. Shape: Natural Pink Ruby 14.50 mm x 13.0 mm = 9.50 ct. Exact Carat Total Weight: ( Silver Stone) 23.35 ct, 4.67 gram. Ring Size; 6.25. Color: pink. Face Ring : 17,0 mm x 21.50 mm. Free Ring Resizing. within the United States. DELIGHTFUL PIGEON BLOOD RED RUBY MAIN STONE 28 CT. GEMS 925 SILVER RING SZ 6.5. COLOR TOP PIGEON BLOOD RED ( MAIN STONE ). ( MAIN STONE WEIGHT 28 CT. ). OTHER ROUND DIAMOND CUT PINKISH RED RUBY 2.8 MM. COLOR : TOP PIGEON BLOOD RED ( MAIN STONE ). ( MAIN STONE WEIGHT 40.20 CT. ). ROUND DIAMOND CUT PINKISH RED RUBY 3.0 MM. OTHER : ROUND DIAMOND CUT WHITE SAPPHIRE 1.8 MM. SHAPE/CUT : OVAL FACET ( MAIN STONE ). Fascinating, Big Bold and Beautiful! Very Elegant Pink Red Ruby Lady's Ring – Oval facet cut Styling Ruby Beautiful center stone - VVS -Transparent Heated Beauty - Very beautiful Stunning Cut Pink Red Ruby 13.5 mm x 11.5 mm = 7.80 ct center stone. DELIGHTFUL RICH RED RUBY OVAL CUT 8.0 CT. STERLING 925 SILVER TIGER RING SZ 7.0. OTHER : GREEN GARNET ROUND DIAMOND CUT 1.7 MM.X 2 PCS. PINK RED RUBY ROUND DIAMOND CUT 1.5 TO 1.7 MM.X 91 PCS. LUSTER : DELIGHTFUL. FASCINATING! BIG! 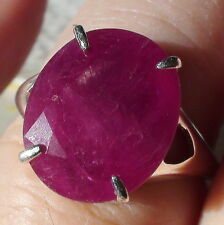 NATURAL BLOOD PINK RUBY RING 925 STERLING SILVER.SIZE 9.0. Shape:Natural Ruby with beautiful natural inclusions 8.0 mm x 6.50 mm. = 1 pcs, 3.0 mm x 16 pcs, 1.5 mm x 12pcs. Color: Blood, Pink red. Ring Size; 9.0. Face Ring : 21,5 mm x 19.50 mm. Exact Carat Total Weight: ( Silver Stone) 32.00 ct, 6.90 gram. HUGE BEAUTEOUS PIGEON BLOOD RED RUBY 43.1 CT. STERLING 925 SILVER RING SZ 7.25. LUSTER : HUGE BEAUTEOUS. COLOR : PIGEON BLOOD RED. FACE RING 25 X 18 MM. ORIGIN : MOZAMBIQUE. 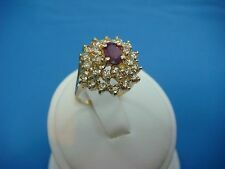 WEIGHT : WEIGHT OF SILVER 5.57 g. WEIGHT OF STONE 43.1 ct.
10K Solid Yellow GoldNatural Ruby Diamond assent Band Ring 3.0 grams. Weight: 3.0 grams. Size: 7.0.
! 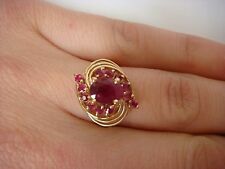 SPECIAL RUBY AND DIAMONDS 10K GOLD COCKTAIL RING, 3.9 GR, SIZE 8.25. SPECIAL RUBY AND DIAMONDS 10K GOLD COCKTAIL RING. Since 1978, Leon's Jewelry is located in Center City Philadelphia at the heart of Jewelers' Row, just two blocks from the Liberty Bell and Independence Hall. PIGEON BLOOD RED RUBY MAIN STONE 7.80 CT. TOURMALINE SAPP 925 SILVER RING SZ 8.5. COLOR : TOP PIGEON BLOOD RED ( MAIN STONE ). OTHER : OVAL FACET PINK RASPBERRY TOURMALINE 7.0 X 5.0 MM. OVAL FACET PINK RASPBERRY TOURMALINE 5.0 X 4.0 MM. 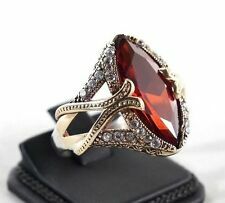 AAA Quality 925 Silver Jewelry, Red Ruby & Cz Lady Ring. OTHER GEMS Cz. MAIN STONE Ruby. 70.00 CT ,TOTAL WEIGHT (GEM(S) SETTING) 9.00 gr. COATING Partially Gold Coated over bronze. 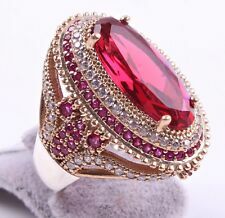 ALLURING PIGEON BLOOD RED RUBY MAIN STONE 36.70 CT. SAPP 925 SILVER RING SZ 8.5. COLOR TOP PIGEON BLOOD RED ( MAIN STONE ). ( MAIN STONE WEIGHT 36.70 CT. ). OTHER ROUND DIAMOND CUT WHITE SAPPHIRE 1.7 MM. Stunning 4.5 ct natural, untreated ruby Sterling Silver ring. There is a gold plating over the Sterling Silver giving it a bright gold look. The inside of the ring is marked "925" and the bottom of the ring shows an unknown maker's mark. Sterling 925 Silver Jewelry Micro Pave White Cz Lady Ring. OTHER GEMS Ruby. 35.00 CT ,TOTAL WEIGHT (GEM(S) SETTING) 7.00 gr. PRODUCT TYPE Ring. COATING Partially Gold Coated. Ruby and silver are clean. warm water. PAT DRY ring box. lab created / grown Ruby. (identical to the natural Ruby in every way). Gently rub in your palms with a drop. Composition, Hardness, and Optically. Simply breathtaking is all I have words to say ! One of a kind styling, Fascinating, Big Bold and Beautiful! Top class details hand-made setting with quality hallmarked of 925 sterling silver. Pictures do this ring no justice ! · STERLING SILVER RING IN CLASSIC THAI design art. size 8.5 OR 58 R. STONE SIZE APPROX : 12 X 10 MM. GRACEFULLY DEEP RED RUBY OVAL CUT 26.85 CT. STERLING 925 SILVER RING SZ 7.0. LUSTER : GRACEFULLY. OTHER : WHITE SAPPHIRE ROUND DIAMOND CUT 2.5 MM.X 30 PCS. PINK RED RUBY ROUND DIAMOND CUT 2.0 MM.X 30 PCS. Material= 925 Sterling Silver. Coating=Yellow Part is Bronze. Ring Size(US)= 9. Ring Face(mm)= 30x28. Stamboul Jewelry. Resizing (For Free)= 7 to 11(US). OVAL CUT PIGEON BLOOD RED RUBY 46.65 CT. STERLING 925 SILVER RING SZ 6.75. COLOR : PIGEON BLOOD RED. OTHER : PINK RED RUBY ROUND DIAMOND CUT 2.2 MM.X 6 PCS. SHAPE : OVAL(MIAN STONE). ORIGIN : MADAGASCAR. 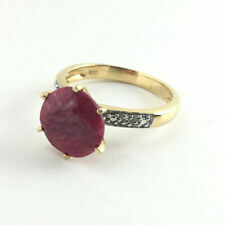 PIGEON BLOOD RED RUBY MAIN STONE 6.20 CT. SAPPHIRE 925 SILVER GOLD RING SZ 6.25. COLOR : TOP PIGEON BLOOD RED ( MAIN STONE ). ( MAIN STONE WEIGHT 6.20 CT. ). OTHER : ROUND DIAMOND CUT WHITE SAPPHIRE 1.8 MM. RUBY & 925 SILVER RING ( WHITE GOLD COATINGS ). RING SIZE : US 7.00 ( RESIZE : OK ). ( MAIN STONE WEIGHT 52.35 CT. ). OTHER : RED RUBY ROUND DIAMOND CUT 1.5 MM. SHAPE : OVAL ( MAIN STONE ). ORIGIN : MADAGASCAR. INCREDIBLE RICH RED RUBY OVAL CUT 11.85 CT. STERLING 925 SILVER RING SZ 8.25. OTHER : PINK RED RUBY ROUND DIAMOND CUT 1.7 MM.X 22 PCS. SHAPE : OVAL(MIAN STONE). COLOR : RICH RED. FACE RING 21 X 15 MM. MAGNIFICENT DEEP PIGEON BLOOD RED RUBY 10.55 CT. REAL 925 SILVER RING SZ 4.75. COLOR : DEEP PIGEON BLOOD RED. OTHER : WHITE SAPPHIRE ROUND DIAMOND CUT 1.5 MM.X 10 PCS. PINK RED RUBY ROUND DIAMOND CUT 1.7 TO 2.2 MM.X 35 PCS. RUBY & 925 SILVER RING ( WHITE GOLD COATINGS ). RING SIZE : US 7.50 ( RESIZE : OK ). LUSTER : FASCINATING. ( MAIN STONE WEIGHT 38.95 CT. ). OTHER : CHAMPAGNE TOPAZ ROUND DIAMOND CUT 1.7 MM. COLOR : RED ( MAIN STONE ). RUBY & 925 SILVER RING ( WHITE GOLD COATINGS ). RING SIZE : US 7.25 ( RESIZE : OK ). ( MAIN STONE WEIGHT 32.40 CT. ). OTHER : RED RUBY ROUND DIAMOND CUT 1.2 MM. SHAPE : OVAL ( MAIN STONE ). ORIGIN : MADAGASCAR. RUBY & 925 SILVER RING ( WHITE GOLD COATINGS ). ( MAIN STONE WEIGHT 58.90 CT. ). RING SIZE : US 7.25 ( RESIZE : OK ). OTHER : WHITE SAPPHIRE ROUND DIAMOND CUT 2.2 MM. COLOR : RED ( MAIN STONE ). SHAPE : CUSHION ( MAIN STONE ). MAGNIFICENT PINKISH RED RUBY OVAL CUT 28.65 CT. STERLING 925 SILVER RING SZ 7.5. COLOR :PINKISH RED. LUSTER : MAGNIFICENT. OTHER : GREEN GARNET ROUND DIAMOND CUT 1.7 MM.X 12 PCS. PINK RED RUBY ROUND DIAMOND CUT 1.7 MM.X 38 PCS. RUBY & 925 SILVER RING ( WHITE GOLD COATINGS ). RING SIZE : US 7.75 ( RESIZE : OK ). ( MAIN STONE WEIGHT 25 CT. ). OTHER : RED RUBY ROUND DIAMOND CUT 1.7 MM. SHAPE : OVAL ( MAIN STONE ). ORIGIN : MADAGASCAR. LUXURY PIGEON BLOOD RED RUBY MAIN STONE 47.3CT. SAPPHIRE 925 SILVER RING SZ 7.25. COLOR : TOP PIGEON BLOOD RED ( MAIN STONE ). RUBY & 925 SILVER RING. ( MAIN STONE WEIGHT 47.30 CT. ). OTHER : ROUND DIAMOND CUT WHITE SAPPHIRE 1.2 MM. BEAUTIFUL RICH RED RUBY 4.9 CT. STERLING 925 SILVER BUTTERFLY RING SZ 9.0. GREEN GARNET ROUND DIAMOND CUT 1.0 TO 1.2 MM.X 9 PCS. WHITE SAPPHIRE ROUND DIAMOND CUT 3.0 MM.X 1 PCS. OTHER : YELLOW GOLD & BLACK RHODIUM-PLATED 925 STERLING SILVER RING. COLOR : TOP PIGEON BLOOD RED ( MAIN STONE ). ( MAIN STONE WEIGHT 40.70 CT. ). OTHER : OVAL FACET WHITE SAPPHIRE 5.0 X 4.0 MM. SHAPE/CUT : OVAL FACET ( MAIN STONE ). ORIGIN : MADACASGAR. RING SIZE : 6.00. COLOR : TOP PIGEON BLOOD RED ( MAIN STONE ). ( MAIN STONE WEIGHT 17.70 CT. ). OTHER : ROUND DIAMOND CUT WHITE SAPPHIRE 1.5 MM. ORIGIN : MADACASGAR. RING SIZE : 6.75. Resize ring Service. We can resize ring. COLOR : TOP PIGEON BLOOD RED ( MAIN STONE ). ( MAIN STONE WEIGHT 23.70 CT. ). OTHER : ROUND DIAMOND CUT WHITE SAPPHIRE 1.8 MM. SHAPE/CUT : ROUND FACET ( MAIN STONE ). ORIGIN : MADACASGAR. RING SIZE : 7.50. Pave Diamond Bangle. Polki Diamond Bangle. Carved Gemstone Pendant. Diamond Wedding Bangle. 925 Sterling Silver Jewelry. Pave Diamond Bead Ball. Rose Cut Diamond Bead. Wide Cuff Bangle. 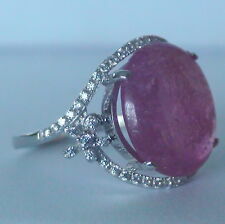 BEWITCHING DEEP PINKISH RED RUBY 28.1 CT. STERLING 925 SILVER RING SZ 5.75. LUSTER : BEWITCHING. COLOR : DEEP PINKISH RED. FACE RING 19 X 17 MM. WEIGHT : WEIGHT OF SILVER 5.07 g. WEIGHT OF STONE 28.1 ct.
RUBY & 925 SILVER RING ( WHITE GOLD COATINGS ). RING SIZE : US 6.75 ( RESIZE : OK ). ( MAIN STONE WEIGHT 9.80 CT. ). OTHER : RED RUBY ROUND DIAMOND CUT 1.2 MM. SHAPE : OVAL ( MAIN STONE ). ORIGIN : MADAGASCAR. 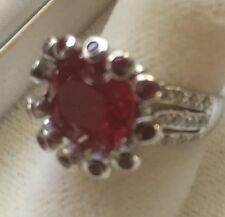 GORGEOUS RICH RED RUBY OVAL CUT 14.05 CT. STERLING 925 SILVER RING SZ 9.25. OTHER : PINK RED RUBY ROUND DIAMOND CUT 1.7 MM.X 8 PCS. SHAPE : OVAL(MIAN STONE). COLOR : RICH RED. FACE RING 23 X 22 MM. FABULOUS PINK RED RUBY OVAL CUT 20.15 CT. STERLING 925 SILVER RING SZ 6.5. OTHER : WHITE SAPPHIRE ROUND DIAMOND CUT 2.0 MM.X 28 PCS. PINK RED RUBY ROUND DIAMOND CUT 1.7 MM.X 20 PCS. YELLOW SAPPHIRE ROUND DIAMOND CUT 2.0 MM.X 4 PCS. GENUINE RUBY AND DIAMONDS LADIES COCKTAIL RING 5.9 GRAMS, SIZE 6, 1.50 CT T.W.